After President Donald Trump confirmed in early March that he would meet with North Korean leader Kim Jong Un, the world has been eagerly watching to see what will happen. If the potential meeting were to happen, six countries in particular – the US, North Korea, China, Russia, South Korea and Japan – will look to benefit from it. Kim reportedly told Chinese President Xi Jinping last week that he wants to return to the six-party nuclear talks involving these countries. “I’m going to be cautiously optimistic that a meeting will actually happen,” Rodger Baker, Stratfor’s vice president of Asia-Pacific Analysis, told Business Insider. Baker said he thought it was a good decision for Trump to meet with Kim, adding that the only downside to the two speaking could be a return to the bellicose rhetoric the world witnessed in 2017.
Business Insider spoke with Baker about what the six parties would like to see from the potential meeting. 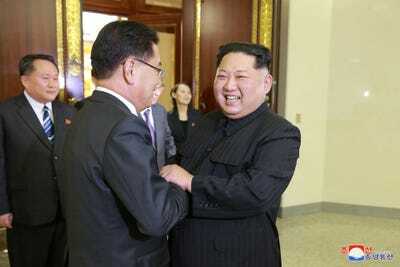 KCNANorth Korean leader Kim Jong Un greets a member of the special delegation of South Korea’s President at a dinner in this photo released by North Korea’s Korean Central News Agency (KCNA) on March 6, 2018. Kim’s ultimate goal is to “gain international legitimacy, which gets them access to money, resources, finance, investment, infrastructure development, technology for their own industry, markets for their own products,” Baker said. “It’s moving them more and more into the space of a normal and recognised country,” he said, adding that they have taken a hard stance against the US out of fear that the Americans may renege on any potential compromise in the future and overthrow the Kim dynasty. “The stated policy of the United States, no matter which administration, is the complete verifiable and irreversible denuclearization of North Korea,” Baker said. Xinhua News via TwitterKim Jong-un and Xi Jinping. 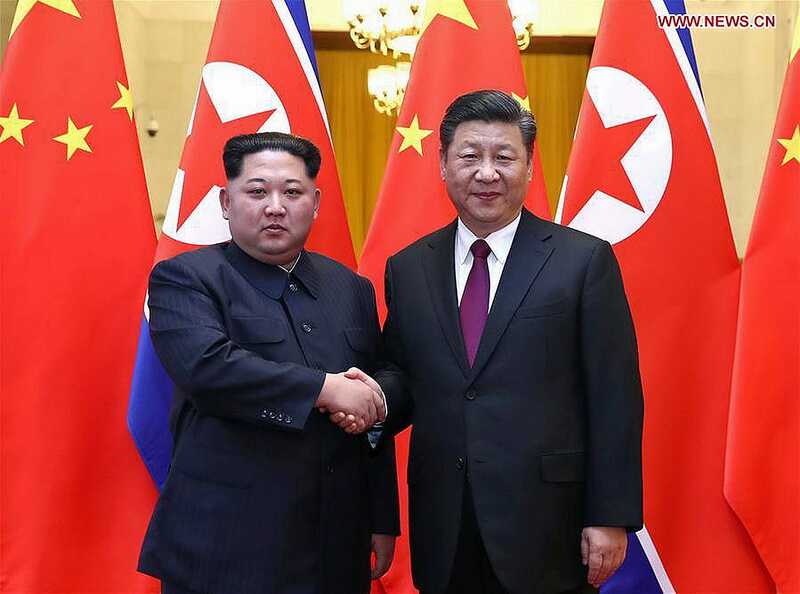 China is focused on the “technology transfer, manufacturing transfer, infrastructure development in North Korea to facilitate the economic development of North Korea,” Baker said. “This is something China has been pushing for a while, that if North Korea can be focused on its economic structure then – yeah, they may still have nuclear weapons here and there, but in general they are not going to be causing a lot chaos right there on the border,” he said. “The Chinese top-tier concern is actually the collapse of North Korea,” according to Baker, adding it would cause hundreds of thousands of refugees would flow into China, possibly bringing loose North Korean missiles and nuclear weapons. To ensure this doesn’t happen, China would like the sanctions to be eased to “create the space for some form of engagement” and for economic activity to pick up. “Russia’s big issue on North Korea is really utilising North Korea as an access route to the South Korean market, and to utilise the Rason area as a warm water Russian port in North Korea,” Baker said. “The Russian view of this is they don’t have a huge stake in the outcome unless … North Korea becomes a key ally of the Unites States,” he said. “The short term issue for [South Korea] is stop this sense that conflict and war is imminent,” Baker said. The biggest thing for Japan is that “there are North Korean medium-range missiles” aimed at them, and that North Korea has been kidnapping Japanese citizens.